The decorations have been hung throughout the Alice Lloyd College campus, and Santa Claus has visited the campus to officially welcome the Christmas season. On Sunday, December 3rd, the ALC Craft Shop hosted their annual Christmas Pretties dinner and the Voices of Appalachia choir performed the traditional ALC Christmas Concert. The Christmas Pretties dinner hosts local families to campus for a festive meal and gives children a chance to receive a gift from Santa Claus. Following the dinner, the VOA choir welcomed the ALC community to enjoy Christmas music. The Christmas Pretties Program began when Alice Lloyd and her mother, Ella M. Geddes, first settled on Caney Creek in 1917. Annually, Mrs. Lloyd and Mrs. Ella M. Geddes dedicated their time to gathering donations for presents to be distributed over hills and into some of the most remote areas of Appalachia. Today student workers stationed in the ALC Craft Shop wrap approximately 3,500 gifts annually to be distributed to local elementary schools. For many ALC students, the Christmas Pretties Program gives them an opportunity to give back to the children of their hometowns, with some students even donning Christmas costumes to hand out presents. Throughout the century the program has evolved, but its purpose of bringing the joy of Christmas to children living in the mountains has remained the same. 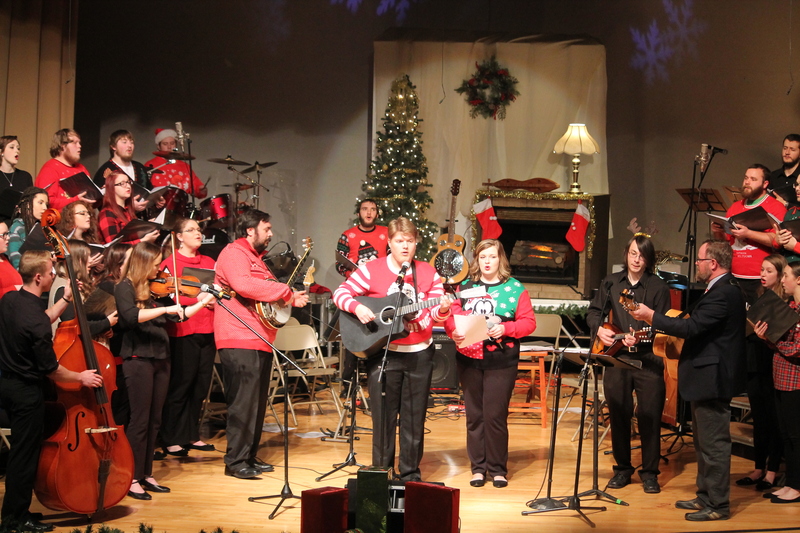 After the dinner, a Voices of Appalachia Christmas Concert was held in the Campbell Arts Center at 7:00. As family, friends, students, faculty, and staff entered the Christmas themed auditorium they were serenaded by the pre-show entertainment that included duets and trios that sang melodies such as “Tennessee Christmas” and “Still, Still, Still”. A wide variety of songs were sung this year from Abner Grender’s rendition of “O Holy Night” to Patty Loveless’s song “Bluegrass, White Snow”. The performance captivated the audience with its large ensemble. Usually consisting of stringed instruments and percussion, Director Richard Bowers extended the ensemble this year to include trumpets, saxophones, bells, and flutes. The expanded ensemble accompanied the choir in the songs “Holiday Favorites” and “Dawning Light”. The holiday season is one of many opportunities that Alice Lloyd College has to give back to the local community throughout the year. Coming together to celebrate the holidays with the Christmas Pretties Program and the Voices of Appalachia choir helps to commemorate the legacy of Alice Lloyd and further foster a generation of servant leaders.